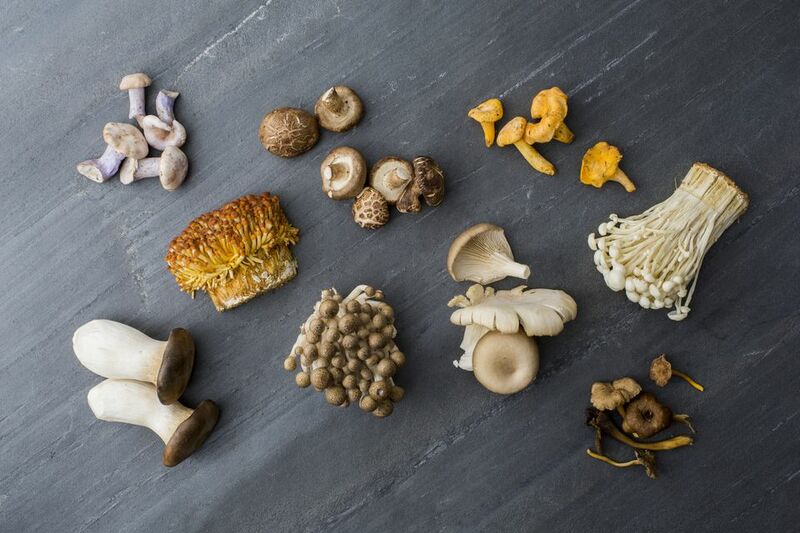 Mushrooms are fungi, which may sound gross but which cooks know are inspiring—inspiring for their unique earthy flavors and unmatched toothsome textures. While the mushrooms below are all singular in their look and taste, they are all mushrooms, which means they have a few things in common. First and foremost, always look for bright, unblemished mushrooms and store them in paper bags (no plastic! they'll get mushy!). Use within a few days of buying. For longer storage, consider drying them. Second, all mushrooms will soak up all the water they come into contact with, so keep them dry. Cultivated mushrooms can be brushed clean with a mushroom brush or dry paper towel. For mushrooms that need a bit more of a clean, a quick swish or rinse in water and immediately laying them out on a clean kitchen towel or layers of paper towels is the way to go. Never wash mushrooms ahead of time—clean them right before using them. There are as many ways to cook mushrooms as there are days of the decade. Once you've had them sautéed, grilled, and fried, consider using them to flavor risotto or to top a different kind of pizza. These are the mushrooms most of us first think of when we hear the word "mushroom." They come in a range of sizes. For deeper flavor look for specimens whose caps have "opened" so you can see the dark brown gills under the cap. You can use them in tons of ways in soup. Whenever you cook them, remember that like all mushrooms, they will give off quite a bit of liquid, so keep the heat high and the pan spacious. A fun thing to keep in mind is that you can use the caps and stems differently. Finely chopping the stems creates a duxelles that can create a rich base layer of flavor to a wide range of dishes. Chanterelle mushrooms have a more elegant flavor than most other mushrooms. They are gently earthy and wonderfully nutty. Older chanterelles can take on a metallic flavor, so always taste just the corner of one raw before cooking up an entire batch. Since they only grow wild, look for them at places that might sell foraged foods such as specialty markets and farmers markets. If you want to try and forage them for yourself, always learn from an experienced mycologist or mushroom expert. If you find yourself with an abundance of chanterelles, consider ​making pickled chanterelles. These are also known as beech mushrooms. Like the better-known enoki, they grow and are sold in clusters that can be pulled or cut apart for cooking and serving. Their bitter flavor softens and sweetens when cooked, so you're going to want to cook them despite the temptation to add them raw as a lovely garnish. Cremini mushrooms look a lot like standard white button mushrooms, just brown. While the two are interchangeable in recipes, creminis have a slightly denser texture and deeper flavor than button mushrooms. Many people don't know that creminis are, in fact, baby portobellos (or, portobellos are just overgrown creminis!). They are especially delicious with wild rice, either in a pilaf or soup. Enoki mushrooms, also known as winter mushrooms, are often added to bowls of ramen or other soups almost as a garnish. They have a very mild (sometimes almost undetectable) flavor. Enoki ​grows in and is sold in bunches. Pull or cut them apart into smaller sections or individual stalks as you like. Try them sautéed to enjoy their distinctive flavor to its fullest. Bright red lobster mushrooms are found in the Western U.S., where they grow wild. Their name comes from their color, not their taste profile! They have a mild, nutty flavor. Sadly, like many wild mushrooms, it's best to cook them before eating them, and their color will fade in the heat. These fat fungi are also called king oysters, French horn mushrooms, and king brown mushrooms. Their thick stems stay nice and meaty when cooked, making them ideal for using in vegetarian dishes looking for that "meaty" element. Maitake is also known as hen-in-the-woods. It has a wonderfully firm texture, even when cooked, along with a surprisingly delicate texture from the overlapping "leaves" that form these wild mushrooms. Morels are little spongey-looking cone-shaped mushrooms that vary in color from pale, almost white beige to deep dark almost black brown. They grow wild and have a distinctive mildly earthy flavor. Oyster mushrooms are more fragile than other cultivated mushrooms. Their delicate flavor and texture respond best to quick cooking over high heat like stir-frying. Look for oyster mushrooms of different colors, including yellow oyster mushrooms and pink oyster mushrooms (know, however, that the distinctive color will fade when cooked). Thought of by many as the king of mushrooms, porcini are usually sold dried in the U.S. Fresh porcini are worth seeking out, however, since their deep, earthy, all-mushroom-all-the-time flavor is incomparable. They are sometimes labeled by their French name, cèpe, or their Latin name, Boletus edulis or simply, bolete. Portobellos are big, fat, meaty, juicy mushrooms. As big as a human hand, these mushrooms are great for grilling and roasting. A whole grilled portobello makes a fabulous vegetarian main dish or burger stand-in. Fun fact: portobellos are simply creminis that have been allowed to grow up and grow out. Look for fully exposed dark brown gills for the best flavor. Many people think shiitakes are wild. While they do grow in the wild, shiitakes sold at stores are farmed. This is because cultivating them has proven so successful, as they're very popular. Fresh shiitakes come in a range of sizes. Bigger ones have a deeper flavor but also a tougher texture (isn't everything in life a bit of a trade-off?). Shiitakes stems tend to be tough and are best removed before cooking. They make delicious mushroom stock, however, so save them in your freezer until you have a few cups' worth. Shiitakes can stand up to strong flavors and are particularly good with ginger, soy, and even chiles. Make them the star in this rice noodle dish. Or, try them with something just a bit sweet such as mushroom-stuffed squash. Sometimes called black chanterelles because of their similar shape, black trumpet mushrooms have a rich, almost smokey flavor. Some people claim the dried versions taste like black truffles, but most mushroom lovers would say that's overstating the matter. They grow wild; look for them from foragers in the late summer in colder climates and all year long in more temperate areas.